Tandem bicycles have special requirements. The increased weight of two riders places extra stress on wheels. Cranks require different threading for pedals than solo bikes. Rear hubs need to accommodate drum brakes to prevent the build-up of heat in the rims during long twisting descents. Stokers require extra shock absorption from their saddles since they can't anticipate bumps as easily as they could on a solo bike. Tandems often need a wider range of gears than a solo since they can reach much higher speeds due to aerodynamic advantages. Since the major component manufacturers don't give tandems as much attention as solos, stock component groups don't meet the needs of tandem cyclists. But with a little understanding of a tandem's special requirements, components can be selected to give the tandem rider the same level of performance as the solo. Like all wheels I recommend and build, my tandem wheels come with a lifetime guarantee. If one of my wheels ever breaks a spoke that hasn't been damaged by an over-shifted chain or some other obvious damage from impact with a foreign object, I will replace the spoke, and true the wheel while you wait at no charge. If one of my wheels ever needs truing, I will true it while you wait, no charge. I guarantee that my workmanship and choice of spokes will outlast the rim and/or hub. Of course my guarantee is not of much practical value if you aren't one of my local customers. Shipping a wheel back and forth from California to New Hampshire gets expensive, and my guarantee covers my work, not shipping. When I began my business and my guarantee in 1988, most people had never heard of the internet, and all of my customers were local. Wheelset prices with Phil Wood hubs are for 140mm or 145mm rear hub axle spacing. Current production Santana tandems have a 160mm rear axle spacing. Add $35.00 for 160mm rear spacing. I keep 40 and 48 hole 160mm rear Phil hubs in stock. In 145mm, I also stock 36 hole. White Industries doesn't make a 160mm rear hub. I stock front and rear hubs for disc brakes, except in the 160mm size. Individual rear or front wheels are available. I hope to get some listed soon. For now, please call for a quote. My labor charge for building 40 or 48 spoke wheels is $ 50.00 when you are purchasing a complete wheel, rather than having me rebuild a wheel on your old hub. Rebuilds cost an additional $10 for labor. 14-16 butted spokes cost $ each. 13-14 butted spokes cost $ 1.25 each. I generally build with Wheelsmith DB-14, (2.0-1.7-2.0mm) spokes for front wheels, and Wheelsmith DH13 (2.3-2.0mm) spokes for rear wheels. DH13 spokes increase the very slight possibility that the rim will crack with extended use. But heavy teams may need them on the rear wheel to prevent spoke breakage with heavy touring loads. Either problem, cracking rims or breaking spokes, is rare when wheels are built with suitable components, high spoke counts and proper spoke tension. I mention these issues not to scare you off, or make excuses for wheel troubles, but to help you understand how I arrive at the recommended rims, hubs, spoke type and spoke counts for various applications. No wheel is perfect, and no wheel builder can predict the future and say that in fact you will never break a spoke or have a rim crack. What I do is try my best to deliver a wheel that will give you the maximum life possible for the use you give it. The number one cause of wheel failure is insufficient spoke tension. When spokes are too loose, they change tension with every revolution of the wheel. This is because the low tension isn't enough to keep the spokes at the bottom of the wheel from losing tension under the weight of the riders and gear. So as the wheels rotates, the spokes are constantly gaining and losing tension as they go around in a circle. That change in tension causes the shape of the spoke to change with every wheel revolution. 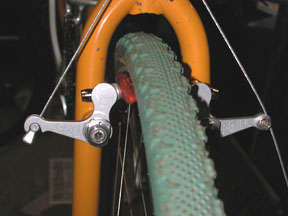 It changes its shape at the "elbow", where the spoke contacts the hub flange. This repeated movement causes the spoke to harden and become brittle at the elbow, and it eventually breaks. With sufficient tension, the spokes maintain tension while the wheel is rotating. Since they maintain tension, they don't change their shape, and don't become brittle. If they don't become brittle, they don't break. It's that simple. Low spoke tension can be caused by several things. The builder may not have tensioned the spokes enough. Or, the rim could be too flexible. A rim that doesn't resist flattening under high loads can cause the tension to drop even if the wheel is built with enough tension. Taking a superlight racing rim and adding spokes doesn't make it suitable for tandem touring. And finally, a rim that's dented or warped, however slightly, will have some spokes with lower tension than others. Those with low tension will eventually fail. So there are many factors that determine how durable your wheels will be. I try not to recommend wheels that are heavier than necessary to get the job done. While I have to laugh at things like carbon fiber forks on tandems, I see no reason to carry more weight than is needed. It's silly to spend hundreds of dollars to save a couple of ounces on a tandem. But many component choices are between two items that cost the same. If a $60 rim that weighs 3 oz less than another $60 is strong enough for your application, why use the heavier rim? So when you call to order wheels, be prepared to tell me how much the two of you weigh, how much gear you'll be carrying, what type of terrain, whether you like riding on dirt roads, or just pavement, and how you feel about riding in the rain. The more I know about how the wheels will be used, the easier it will be to build you wheels that serve your needs. Keep in mind that the best wheels are useless without suitable tires. Most of the tandems I see for sale from the best known companies ship with tires that are too small for tandem cycling. And many frames lack the clearances for properly sized tires and fenders. Tandem manufacturers do this because they are all competing to make the lightest tandems possible for a given price. Building the frame with adequate clearance would add to the frame's weight, and I guess the manufacturers figure their customers are too stupid to use anything except weight when evaluating a tandem. Who knows? At any rate, when buying a tandem frame, be sure that the builder gives you enough space for 35mm width tires and fenders, unless you know for a fact that the bike will never be used for touring. There should be at least 10mm between the tires and the fenders. Wheelsets for fast road riding and weekend touring. The 22mm wide Mavic T217 rims work best with tires 35mm or smaller. If you ride 28mm or 32mm tires, these rims are ideal. Wheelsets for moderately loaded touring. Wheelsets for heavily loaded touring. The Sun Rhyno Light rim is heavier and wider than the Mavic A719/T520. This can be a benefit for loaded touring. With heavy loads, you'll want to use a wider and taller tire, in fact, you'll probably want to use the widest tire you can fit in your frame. A wider rim will keep the sidewalls of the tires more vertical resulting in better stability. If your frame can't accommodate a tire larger than 700x32 you should choose the Sun CR-18 rim rather than the Sun Rhyno Light. The Rhyno Light only makes sense for use with larger tires such as the Continental Top Touring 200 700x37 or 700x47. But the Sun rims aren't as round and true as the Velocity or Mavic rims, so in order to keep the spoke tension even and the wheel stable, the wheel will usually not be quite as round and true as it would be if built with a Velocity or Mavic rim. The Sun CR-18 is a nice lower cost alternative to the Mavic A719/T520 rim. The CR-18 lacks the precisely milled sidewalls and welded joint of the Mavic A719/T520s but they build up a very nice wheel. Their brushed sidewalls are quite smooth and give good braking performance. They weigh a bit less. I also offer the Shimano Tandem hubset as a lower cost alternative to the Phil Wood. The Phil hub uses readily available sealed cartridge bearings. The bearings can be easily replaced with only two 5mm Allen wrenches. The axles on front and rear hubs are 15mm in diameter for high strength and stiffness. 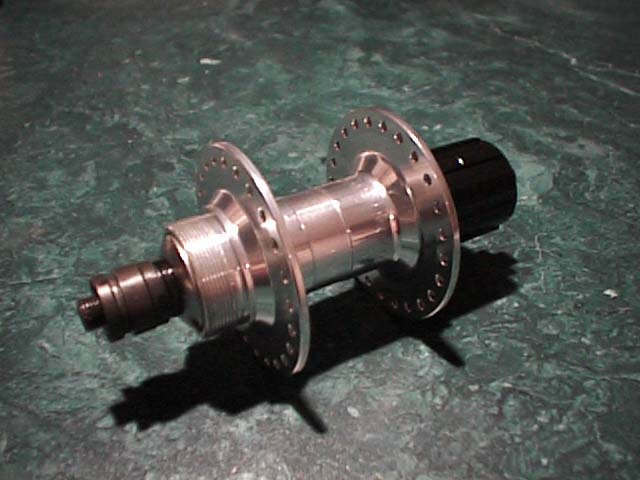 The Shimano hubs use traditional cup and cone bearings. Shimano's seals are integrated with the dust caps and are the best available for this type of hub. While most of the internal parts of the Shimano hubs are available as replacements, all of the internals parts of the Phil Wood hubs are. Shimano tandem hubs may not be the best choice for heavy loaded touring in hilly terrain or mountain biking. 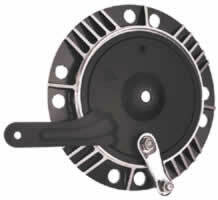 The freehub body can sometimes crack from the high torque caused by extremely low gearing and steep hills. But for recreational road riding, which most people do, and for weekend trips, they hold up very well, and are a great value. I like them a lot. I no longer stock freewheel type rear hubs for tandems. There are several reasons for this. 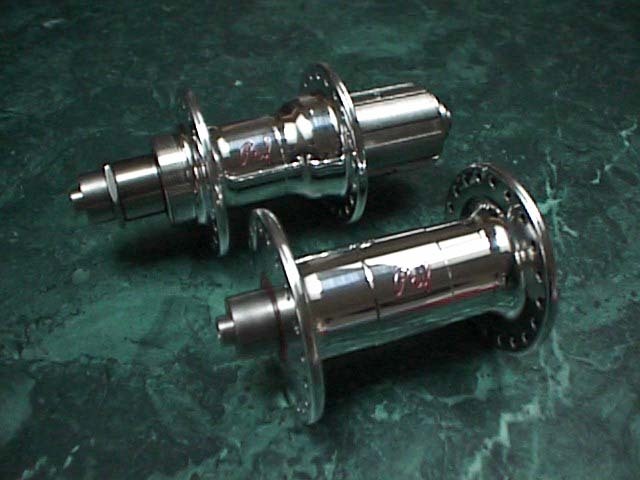 Freewheels are difficult to remove from tandem hubs because of the added torque of two riders. With only a few exceptions, freewheels don't offer Hyperglide shifting ramps which are particularly effective on tandems. Those exceptions are either not ruggedly built for use on tandems or don't offer a suitable range of gears. No eight speed freewheels exist in the correct spacing for Shimano's eight speed shifters. The only freewheel type rear tandem hub that I recommend is the Phil Wood. Since the market for these hubs is small and since the configurations available such as axle length and spoke hole counts is so large I special order these hubs for any customer needing a freewheel hub. This adds only one week to the order time for a wheel. But I would strongly recommend getting a cassette hub if at all possible. We can occasionally get 27" rims, but only occasionally. Call or email for availability. White Industries Disc Jockey Rear High quality rear tandem hub, replaceable cartridge bearings. Accepts ISO disc. Wider version of the Shimano rear tandem hub for frames with 160mm rear axle spacing, such as Santana and Meridian. Rear hub only. Sold without a skewer. Shimano doesn't make a 160mm rear skewer. This is the same hub Santana puts in many of their tandems. In fact, I get them directly from Santana. Salsa skewers have nice long levers to make locking your wheel easier. They come in black or silver. These are for 145mm rear spacing only. Salsa used to offer a set with 160mm rear, but no longer. Price per set. Wide range gearing works best for most folks on a tandem. But many riders use Campagnolo shifters on their single bikes and would like to use them on the tandem as well. Unfortunately, Campagnolo doesn't make gearing suitable for most people who ride tandems. Shimano does make suitable gearing, but their derailleurs aren't compatible with Campy shifters. But now there's a terrific solution. The Shiftmate allows you to mix and match various components from Campagnolo and Shimano. There are four different versions of the ShiftMate, depending on exactly what it is you what to mix and match. $35.00 See the ShiftMate page for all the details. Most stock tandems are fitted with cantilever or V brakes these days. And many are fitted with Shimano STI or Campagnolo Ergo brake-shift levers. These levers are all designed to be used with caliper brakes, not cantilevers or V brakes. 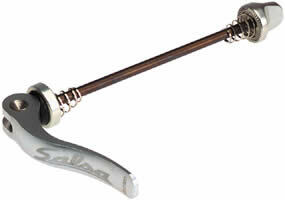 Caliper brakes do not require nearly as much cable pull from the lever to operate properly. So when you use an STI or Ergo lever with V brakes or cantis, you have to add some additional device to amplify the cable pull from the lever. One such device is the Brake Power Booster or BPB from Sidetrak. This devise is attached to your brake cable itself and increases the amount of cable travel at the brake. Another solution is to use cantilever brakes that are designed to be used with standard road levers; Shimano STI, Campagnolo Ergo, and Dia Compe BRS500 racing levers. Paul Components Neo Retro cantilevers have a wide profile, making maximum use of the cable pull of your brake levers. The Paul brakes are the best quality of any brake I have ever seen. The pivots are sealed with "O" rings, both sides have flat wound springs that are individually adjustable, they're very easy to set up, and they will use any V brake pad. I sell them with the Kool Stop V brake pad of your choice. I recommend Kool Stop Salmon pads. $ per brake. Available in silver or black finish. 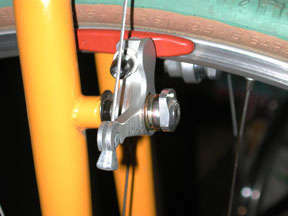 To use the Neo Retro brakes, you'll need to have cable hangers for both front and rear brakes. Most older frames will have a hanger on the rear, and a front hanger can be added to just about any bike. But many newer frames, made for v-brakes, will not have a rear hanger. Luckily, Dia Compe makes rear hangesrs that attach to the seat post binder bolt. The other concern is heel clearance for the stoker on smaller frames. Small frames position the rear brake closer to the stoker's crankset, because the seat stays, (the frame tubes that run from the rear hub toward the stoker's saddle) are angled more to horizontal than on frames built for taller stokers. This can position the brakes close enough to the stoker's heels that they hit. In this situation, the best solution is the "Strange Brake". Tandems require a lot of force to slow down. And long descents can result in heat build-up at the brake pads and rims. A downhill run that may cause no problems on a solo bike can cause rim brakes to over-heat. Tandems can descend faster than solos because of the added weight and increased aerodynamic efficiency. This creates even more heat at the brake pads as you will need to brake more to control your speed. In order to reduce the heat problem at the rim, hub brakes are used to control speed on long descents leaving the rim brake cool and available for quick stops. If the brake pads are melting, you'll be unable to slow to a stop in an emergency or for the stop sign at the bottom of a steep hill. The most popular hub brake is the Arai drum brake. Most rear tandem hubs are threaded on the left side to accept the Arai drum brake. A clamp or a brazed on tab is needed on the left chain stay of the frame to hold the arm of the drum brake. Virtually all modern tandems have a tab brazed on in the proper location for an Arai drum brake. These are now all gone. They are no longer being made. I'm leaving the photo up so people will know what it looks like if they're trying to find a used one. Shimano BL-R400 The best value in a standard road brake lever. Use with Paul Neo-Retro or other brake not needing long cable travel. In stock now, Specialites TA Zephyr cranksets for tandems. Very few left. Sizes now available, 170mm captain's cranks, and 175mm, 172.5mm, 170mm stoker's cranks. 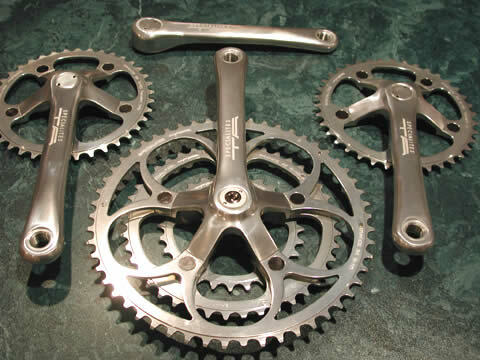 $250 for a full set with 53, 42, 30 tooth chainrings and 38 tooth timing rings. If you want different chainrings, they would have to be purchased separately. Sugino XD 110mm by 74mm bolt circle arms. These work on a 113mm BB axle. Dimension 110mm by 74mm & 130mm x 74mmm bolt circle arms. These work on a 113mm BB axle. Tandems can use higher gear ratios than solo bikes because with two riders you have twice the horsepower but very little if any increase in aerodynamic drag. So larger than normal chainrings can be quite helpful. But modern front derailleurs and Shimano's STI shifters are designed to be used with chainrings having special shift assist ramps or pins to lift the chain from smaller to larger chainrings. For my huge selection of Specialites TA chainrings, see my chainrings page. 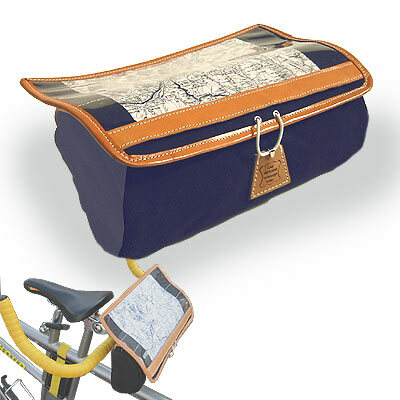 When the stoker tries to use the lower section of a drop (racing) style handlebar, he or she will invariably end up against the back of the captain. So there's really no reason to use a drop style handlebar in the stoker position. The 47 cm wide Profile Stoker bar provides two comfortable hand positions and is wide enough to clear the captain's (ahem) rear end. Please do not place an order without reading my Ordering page first.